My colleague Alex Colon outlined the differences between Apple’s two newest iPads earlier today. On paper, the devices are extremely similar: The same chip, screen resolution, storage options, choices for LTE and camera sensors are in both of the new iPads(s aapl). The biggest variances are in the screen sizes, the actual device size and weight of each, and the $100 difference in price. When I had some hands-on time with both the new iPad Air and iPad mini with retina display earlier this week I immediately thought: “Uh oh. I’m not so sure which I’d buy.” Seriously, I think the choice for some is going to be difficult because the bigger iPad Air isn’t that much bigger than the iPad mini when compared to the prior iPad model. That’s because the new iPad Air is physically smaller than the last iPad model. That can make a difference when it comes to carrying the device around. I’d never argue that the larger iPad Air would be considered more portable than the smaller iPad Air, but slimming the device down does bring a little more size parity to the two tablets. Here’s a mockup to see the size difference, although you can’t truly appreciate it without actually holding both devices together. Note that you can stack the images atop one another and move them around; when doing so, I see that the iPad mini itself is nearly the same size as the iPad Air screen size. Remember too, the last iPad actually weighed 1.44 pounds or 650 grams. The new iPad Air? It’s just one pound, which is equal to 450 grams. That’s a pretty large weight deduction, and means the iPad Air weight is actually closer to the iPad mini — 0.73 pounds or 331 grams — than its own predecessor. I typically prefer smaller slates but the two new iPads are closer than ever in size and weight, making me strongly consider the iPad Air for its larger display. Part of my decision criteria may not apply to you, however: My eyes are getting worse and I’m now wearing bifocals. Of late, I find myself preferring larger screens although I’m still very partial to high-resolution displays. Given the similarities between the two then, which are you planning to buy? Take our poll and chime in on the comments with your reasoning. I think Rene Ritchie at iMore.com made an astute Twitter comment yesterday for those on the fence on which to buy, saying “iPad mini for portability, iPad Air for productivity.” That’s a good starting point, but the decision is still going to be a difficult one for some. At reading distance, my girlfriend’s corrected field is closer to the size of a Mini than an Air. Unfortunately, the iPads with LTE appear to be locked to individual carriers. Hi Kevin: I posed this question in one of your earlier posts. After that, I had a chat with an Apple store rep over the phone, and was told that the LTE iPads are not locked to carriers. Perhaps you can find out more and let us know for sure? I do plan to reconfirm this myself at the store in person before I make any purchases. I’ll check with Apple but I’m basing my info on the Apple Store site. You can actually configure an iPad Air for purchase right now, although you can’t place the order. That’s because of the SIM card. If you remove the SIM card and take your AT&T iPad to say T-Mobile they can just as easily provide you with a SIM card for their network. They cannot lock devices that aren’t on contract to a carrier. Thus, I bought a VZN iPad 3, but installed the SIM from my AT&T iPad 1 (then went and got it replaced for an AT&T LTE SIM) to keep the grandfathered plan. The VZN SIM sits in a spares bag in case I end up somewhere with only VZN coverage. Same same with the new gear. I’m buying one of them, I just haven’t decided which one yet… I was planning on getting the full size iPad with Wi-Fi but now I see the two I’m wondering if an iPad Mini would be better as I could use the saved cash to go for the LTE version and use it on a dash mount in the car, as the iPad Air I think would still be too large to mount in the car…. This article hit home. I was so waiting for the retina mini and now just can’t decide. I am leaning toward the air but will I be sorry to not have waited for the mini? My boyfriend is getting the air so maybe I will be able to make a decision once I check his out, then again maybe notâ€¦. The iPad mini is the first time a tablet from Apple has appealed to me. When the first iPad mini was released I thought, this is it! This is the tablet! but then they let me down with the screen. I was expecting a Retina iPad Mini with an A6 processor and if that was the case I would buy one. They skipped that processor and went straight to the A7. I am so excited for it now. Definitely will be buying it. Although I hear the odds of getting one of the first ones is very, very low and right now it appears the new Mini is having problems with its screen. So I don’t know if I want one of the first batch anyway… But I want one so bad I will take the risk if I get the chance. I don’t plan on upgrading to one of the newer iPads yet, but honestly it would be a tough choice. I guess I would have to put a lot of thought into what I would use it for. If I got an LTE version it would be a mini with retina to offset the price difference of the cellular radio and for increased portability. If I was planning on getting the wifi only model I would get the iPad Air. Buying both ATT 128GB Black-Space Grey models. See plenty of reasons to own both. I’ve been using the iPad mini for the last year. It’s great, but i’ve been wishing the screen size was larger. 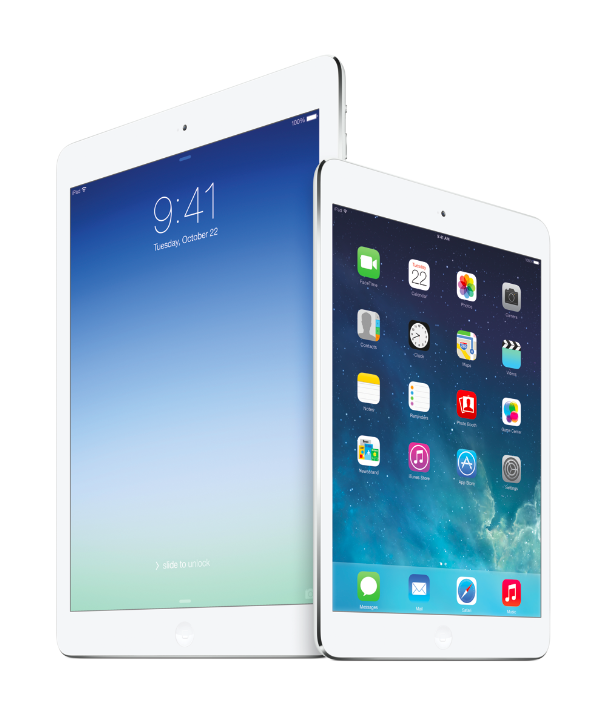 I will sell the mini(good thing apple products hold great resale value) and buy the iPad air. I think the best solution is the MacBook Air with Retina. Oh, wait. That one hasn’t come out yet. It’s called the macbook pro with retina.